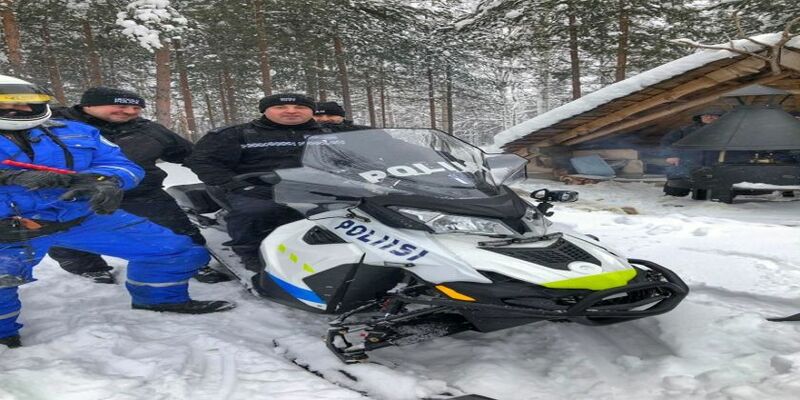 A team of police officers swapped patrol cars for skidoos and the roads of Powys for snow drifts as they took part in a joint training course with the police of Finland. Three PCs and a sergeant from the Brecon Roads Policing Team carried out a two-day winter driving skills course at the Finnish national driving school in Pieksmaämaki. Dyfed-Powys Police Sgt Owen Dillon, PC Mark Jones, PC Julian Clegg and PC Rob Griffiths along with Janes Luckhurst from TISPOL flew to Helsinki, before driving the four-hour journey to Savonlinna, near the Russian border. They stayed the first night as house guests of a Chief Superintendent from the police college sampling some home cooked Finnish cuisine and learning more about Finland and policing. All officers, including Janes Luckhurst a Special Constable in Brecon are members of the International Police Association (IPA) as was their host. The next day they changed into uniform and spent several hours patrolling with two double-crewed traffic patrols meeting traffic officers on skidoos at the side of a frozen lake. The skidoos are used for patrolling the numerous lakes and islands and are a very important resource. A regional newspaper crew met the officers interviewing Sgt Dillon and Chief Superintendent Puustinen who is the Finnish police lead in international policing resulting in a two page article covering the visit. The officers then went to the Finnish national police driving school in Pieksmaämaki, for the two-day winter driving skills course joining officers from all over Finland. They covered a variety of basic and advanced winter skills, practised tactical contact for pursuit management and had the opportunity to use a simulator which turns a car on its roof to practice releasing seatbelts in an inverted car and releasing unconscious casualties safely. During the course the officers explained tactics for safe stopping of vehicles preventing pursuits and other UK police driving skills. The two-day course ended with timed laps of a snowy and icy course, difficult even for trained officers. Officers are looking forward to sharing their learning from the trip, which they paid for themselves, with the rest of the RPU team. Sgt Dillon is planning to host some of the instructors later in the year.